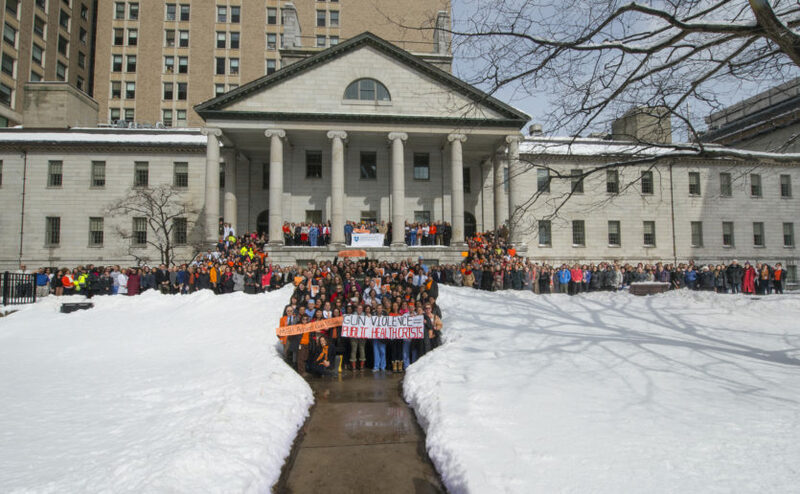 Members of the Mass General community gathered in 2018 to promote gun safety. Chana Sacks, MD, had always been passionate about influencing public policy. But a family tragedy focused her energy. In 2012, Dr. Sacks had just fallen asleep after an overnight shift at Massachusetts General Hospital when she got a call that would change her life. Her cousin’s 7-year-old son had been shot and killed in a mass shooting at Sandy Hook Elementary School, in Newtown, Connecticut. A believer in the power of advocacy, the internist and researcher soon began speaking and writing about gun violence. She and a community of like-minded coworkers at Mass General formed the Gun Violence Prevention Coalition (GVPC). It aims to put the power of medical knowledge and research behind initiatives to prevent death and injury from firearms. “Every gun death is a preventable death,” Dr. Sacks says. Hospitalist Chana Sacks, MD, is an advocate for firearm safety. In recent years, the involvement of Mass General staffers in public policy issues has taken many forms. Leading the way to protect children from nicotine addiction, pediatrician Jonathan Winickoff, MD, helped found the nationwide Tobacco 21 movement. The group has successfully advocated to raise the legal age to purchase tobacco and nicotine products to 21 in hundreds of communities nationwide. He is also seeking to bar the makers of e-cigarettes from selling the sweet and fruity flavors that attract teenagers to a possible lifelong addiction to nicotine. Peter Masiakos, MD, director of pediatric trauma surgery, works for child safety legislation. Addictions specialist Sarah Wakeman, MD, is an activist physician who helped launch the hospital’s Substance Use Disorders Initiative to address the overdose epidemic. She has also worked with state leaders to address the lack of treatment for opioid use disorder among the incarcerated population. Buoyed by an unsinkable spirit and a mountain of research, Lisa Iezzoni, MD, MSc, brings firsthand knowledge to the barriers facing people with disabilities. While attending Harvard Medical School in the 1980s, she was diagnosed with multiple sclerosis, a progressive, disabling condition. The medical school would not write the recommendation letter for her internship/residency application, which blocked her from becoming a practicing physician. Lisa Iezzoni, MD, MSc, of Mass General, defends the rights of people with disabilities at a forum at the Harvard T.H. Chan School of Public Health. Building on prior health policy training, Dr. Iezzoni became a researcher studying health policy. “So even when a door slammed shut for me, I could be on the front lines of major national changes in health policy,” recalls Dr. Iezzoni, who works at Mass General’s Mongan Institute for Health Policy Center. A leading authority on risk adjustment and disability disparities, she now balances her time between research and advocacy on the state and national level. It’s hard to overstate the influence of Dr. Masiakos on child safety law in Massachusetts. Since 2006, the pediatric surgeon has built relationships with legislators, conducted research and organized advocacy groups to help pass a series of laws aimed at protecting children from injury. “My advocacy work started because of this little guy,” he says, pointing to a photograph of his 8-year-old patient, Sean Kearney, who died as the result of an all-terrain vehicle (ATV) crash in 2006. Dr. Masiakos’ considerable surgical skills couldn’t save Sean. But he joined the boy’s parents in pushing for stricter laws for ATV use. After four years of advocacy, Massachusetts passed Sean’s Law, which raised the minimum age for riding an ATV. It also increased penalties for riding illegally. Dr. Masiakos has since been a prime mover in the passage of several other child safety laws. Most recently, he has turned his attention to firearm safety. Along with other members of Mass General’s Gun Violence Prevention Coalition (GVPC) and key state legislators, Dr. Masiakos successfully pushed for a state law holding gun owners criminally liable if children access their guns. He also advocated for passage of a 2018 “red flag” law in Massachusetts. It allows family members to have police temporarily remove guns from those who pose a danger to themselves or others. Dr. Sacks believes she might have pursued a career in advocacy if she hadn’t gone into medicine. Teaming up with Mass General colleagues Paul Currier, MD, and Kim Sheppard Smith, RN, she helped form the GVPC. It has grown to include more than 60 Mass General doctors, nurses, and other health professionals, including Dr. Masiakos. Leaders of the Mass General Gun Violence Prevention Coalition include, from left, Kim Shepherd, RN; Paul Currier, MD; Chana Sacks, MD; and Peter Masiakos, MD. The GVPC collaborated with the state Attorney General Maura Healy, the Massachusetts Medical Society and police organizations to create guidelines to help healthcare providers talk to their patients about gun safety just as they would about other potentially dangerous household risks like chemicals, backyard pools, or medications. These days, GVPC members are visiting Mass General primary care clinics to encourage clinicians to raise awareness about these resources. An added bonus: free gun locks to distribute to patients who may have guns at home. In cooperation with Boston Police, the GVPC also helped support a gun buy-back program in Boston.